Some left-leaning sites have pointed to the chart above as a sign that Obama’s economic policies are a smashing success because total private sector employment has consistently increased in the last thirteen months. However, the problem with this chart is that it misleadingly shows Bush’s last year in office, his worst year, as a foil to Obama’s first two years and three months in office. 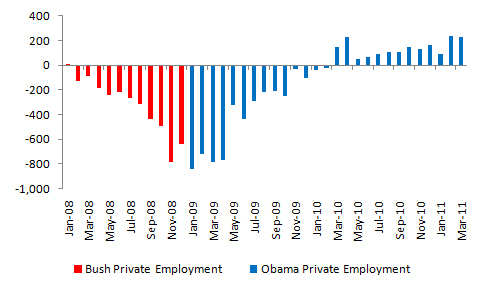 This selective presentation of the data makes Bush’s record look abysmal compared to President Obama’s numbers. However, the unemployment rate is currently a whopping 8.8% and it still has not declined to President Bush’s 7.3% high in December 2008. Furthermore, if one includes President Bush’s entire record, it looks far better than President Obama’s record to date. Over President Bush’s entire presidency, the private sector created a net 188,000 jobs (not including January 2001 data). Surprisingly, this number includes the 3.78 million private sector jobs lost in 2008. In contrast, under President Obama’s administration, the private sector lost a net 3.25 million private sector jobs. The point of this argument is not to assess blame on either administration’s policy. It simply puts the left’s claims in perspective. This entry was posted in Business, Finance and Economics, Policy, Politics and tagged President George W. Bush, President Obama, Total private sector jobs, Unemployment. Bookmark the permalink. It all depends on methodology. If your methodology gives credit to the President who was in office at the end of each given month, the number of private sector jobs created during the Bush administration would have been 141,000. If you give credit to the President who was in office at the beginning of each month, your number sounds about right. I do an iteration of this post each month, and typically compare and contrast both methodologies to be fair to both sides. 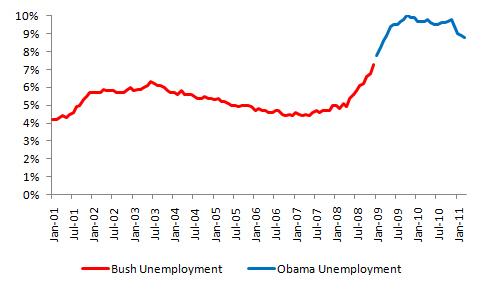 You can check out Bush vs. Obama: Unemployment (August Jobs data) for the most recent iteration. I agree-so you have to ask yourselves: Why would I ever want to vote for Obama again? What has he done but put on the gas as we are driving towards the cliff? I believe that in Bush’s last month’s in office the economy was shedding 400,000-700,000 per month, and this decline was accelerating each month. It’s true that more net jobs were lost during Obama’s first 2 years in office than during Bush’s 8 years, but this comparison is disenguous. A more meaningful comparison is to look at the effectiveness of their respective economic policies. President’s get too much blame and/or credit for what happens in relatively short economic cycles; but, in the longer term you can see the impact of their policies on major indicators. Note that the 2001-3 Bush tax cuts, which cost nearly $1.5 trillion in lost tax revenues, resulted in very little job growth, the overall federal deficit increased by $5 trillion, and unemployment increased from around 4% when he took office to just under 7.6% when he left. Additionally, average real income fell during his tenure. Obama’s record is still developing and there’s plenty to criticize. I, for one, think he’s been too timid. However, it’s pretty clear that overall the economy is markedly better than when he assumed the presidency: unemployment is finally falling, GDP is steadily growing, private sector jobs are being created (while the public sector continues to shrink) and real incomes are rising for the first time in 10 years. The Bush-Obama comparison in my mind is a no-brainer. The point of this post was not to assess the impact of various economic policies, it was simply to refute claims on the left that total private sector job growth has somehow faired better under Obama than under Bush. You can talk about deficits all you want, but Bush had 8 years to run up the 5 trillion dollar deficit you talk about, but a more relevant metric must normalize for the number of years in office. Per year, Obama has easily added more to the debt and deficit than Obama. Furthermore, the Stimulus had limited effectiveness because it merely replace local debt with federal debt. Both Presidents have been a disaster, but Obama has been far worse. what a horrible response! you cant be serious! okay, for one, its not like all policies of the previous president magically start from zero when the other guy takes over. you should know this. Obama is still running the country on many of the previous’ presidents policies (i.e. Bush tax cuts) which are still costing us money and not improving anything. Its not fair, and you knwo it, to say Obama’s deficit is solely on him. If so, than take back your comments of blaming Clinton for leaving Bush a recession (one that started 3 months into Bushs term). you are pathetically partisan!!!! So you are saying the debt has not increased under Obama at a faster rate than it did Bush? And you are claiming that Bush is to blame for tax cuts that President Obama could have eliminated when Democrats had control over both houses of Congress during the first two years of his administration? And you’re calling me “pathetically partisan”? 8 trillion dollars of the debt created in 2009 is on Bush…He signed the 2009 budget with Paul Ryan in December of 2008 before Obama took office. As the 2012 budget will be Obama’s whether he wins or loses the election. I don’t know why people don’t report this. The budget Bush signed was NOT the one that Obama used. Bush did not authorize any of the stimulus. The Stimulus was not part of the 2009 budget. It did not kick in until Oct of 2009 which is when we saw the trend in job loss stop and job growth begin. I am not partisan. There are things to like and dislike by both Presidents and one thing to like is that both Presidents admirably presided over times that were crisis driven. Did either of them get it right 100% of the time? No. Did they each do what they felt was in the best interest of the country? Yes. Did their ideas work out all the time? No. Here is the bottom line. When Clinton had stellar performance on the economy the Republicans constantly took credit saying it was SR Bush’s policies that created it. When W took office, Republicans blamed Clinton for the Recession that started. Now that the shoe is on the other foot, Republicans do nothing but place blame. Republicans increased Government jobs by 1.7 million during the Bush tenure with a mere 600k in private sector job growth in his 8 years. Obama’s policies are just short of net 0 job loss with 4 million jobs added back in and barely 40k of those are Government jobs. Bottom line is I don’t care who is to blame but the one thing I can see based on stats is that we are coming back. Now, if we re-elect Obama then Congress and the Senate have to start working again. Once there is no longer this “make Obama a one term president” philosophy holding back Republicans many great things will come out of it. Electing Romney is a wild card. Based on his “performance” in the past with his Business experience, experience at the Olympics, and his experience as Governor, what you can expect is him to Gut the American people, break things apart, and sell them off to the highest bidder for short term gain. This is not someone I want running my country. Talk about partisan, you don’t really care about the Truth. The truth is when the Democrats control Congress the economy (all of it) gets worse and when the Repulicans control Congress it all gets better. Than trend has been going on since Bush senior. Obama is the biggest amateur on the planet; doesn’t understand High School level economics and neither do any of his supporters. The improvements to the economy right now are because of Republican governors that won in the last mid-term. Where do you get your information, Craig, Fox news? The deficit has shrunk under every Democrat and increased under every Republican since Eisenhower. Do your homework. Why does no one ever talk about how the deflation of the dot com boom affected the Bush administration. Anderson Cooper360 did a spot on this and entitled it “How to lose 5 trillion dollars”. I think I’ve mentioned that, September 11th, and Hurricane Katrina in future comment threads as I do one of these unemployment posts each month. But I do agree with you. Bush did not exactly inherit a boisterous economy. Somewhere I have the stats that matter . Not the BS Liberal idiots put out . Even with the bad years at the end, I think Bush’s unemployment rate averaged about 5.6% . That is amazingly good when you throw in the price of oil caused by our Democrat friends, and 911 caused by the poor abused Muslim terrorists . Throw in the damage caused by Katrina and Bush’s economic model is better than any other President in modern history . Clinton is praised for a good economy . Well duh ! When almost nothing bad happens in the world even a sleaze ball can look like a freaking Einstein . I defy anyone to prove me wrong ! Obama on the other hand had advantages Bush could only dream about . Bush had already started the recovery process . All Obama had to do was follow through and he even screwed that up . Obama had humongous majorities in Congress and managed to screw that up too. Obama took stimulus and sent it to states to keep his union dues paying contributors from being laid off instead of actually spending the money on infrastructure . When the money ran out, there was only Obama’s debt . There was no private sector growth . When the money ran out the states and local governments were screwed and had to lay off Obama’s buddies . I could probably spend a day and make a damning case against Obama as well. I am going to let it accumulate though and then do something closer to the next election when it counts. Even if you look at some of Obama’s green programs, they disproportionately helped union-heavy companies like Ford vs. innovative Silicon Valley companies like Tesla. yeah, and now Ford, GM are making profits and hiring again. Damn Obama!!! Most of this is due to automotive supply shortages in Japan following the Japanese earthquake. The gains you see from Ford and GM resulted from share gains from Japanese automakers who simply could not produce enough cars to meet demand. Once the industry normalizes, these share gains will likely reverse. In other words, these gains had little to do with Obama. HAHAHA! all i can do is laugh at this factless rambling. fact is, Bush was given a surplus, a great economy and all he needed to do was sit at his desk and read “my pet goat.” and the nation would have taken care of itself. But, no he gave out trillion in tax cuts that sent us spiraling into debt (which we are still paying for today) and started a war with Iraq for NO REASON (google “where were the WMDs?). Somehow you state Obama was handed a great economy…WHAT?!?! 4 million jobs were lsot the year before Obmaa took office and the difict was at 1.3 trillion the day he took office before he signed one piece of legislation! So here is your response, that was so “challenging.” There, i defied you. I think people give Clinton way too much credit for a good economy. The internet, with all of it’s opportunities for businesses, job creation and personal wealth dawned during his presidency and created a booming stock market to boot. Bush came in after the dot.com bust. He had to deal with 9/11 and its aftermath, and Katrina. He finally did the thing that Clinton wouldn’t or didn’t. Too much credit and too much blame if you ask me. But you forget that Al Gore created the internet. So there’s that. Bush didn’t do the greatest job of dealing with Katrina. And why did he start a hideously expensive war in Iraq when they had nothing to do with 9/11? But I agree that Clinton was given too much credit for the dot.com boom. Obamanists don’t really care about the truth- they can’t control their jealousy of the rich and even if they can’t get their handouts the want to “get even”. Obama’s aid to US auto companies was aimed at preserving jobs, not greening America. How many people work at Tesla versus the 350,000 or so who work at the Big Three, not to mention the million more who work at auto-related companies? BTW: those and people are still working and feeding their families, at least partly due to the bailout. Pretty good return on my taxpayer dollars, I’d say. Wrong. Not when it cost taxpayers over $400,000 per job saved to prop up companies that had 30 years to go green and didn’t. I had a friend who was working in the parts department of Ford as a summer job before the recession. She was making $35 an hour full time, PLUS OVERTIME, for picking parts off a shelf and calling a courier to pick them up. She was embarrassed to tell people what she made. Her dad was in the “job bank” and was embarrassed by this as well. The bailout put the union on the board (wtf? ), kept the wasteful job banks, and as you say, cost $400k per job saved. Above anything, it was a handout and “thank you” by the Dems out to their union base. “Pretty good return on spending the taxpayers’ dollars” – I’m sure the votes the Dems get from all this in 2012 will have them saying the same! sure, right. Everyone has a “friend” planted somewhere in their story to prove their points. 35 bucks an hour would make your friend a senior manager. starting is $14 per hour and the average is $28 per hour at these companies. Why dont you post your “friends” name and job title. You know i have a friend too. he was a republican and the dumbest person in my college. He went on to be a real jerk and ate babies. Go ahead ask anyone i know, and they’ll tell you the same thing!! Wasn’t b.s., but I can understand the skepticism. Regardless, one has to acknowledge that the waste going on was ridiculous, that $400k per job “bailout” was excessive, and that the Big Three were being outflanked by competitors. As for “factless rambling” I don’t think the facts are what are being challenged here. The numbers are what they are, it’s just peoples’ interpretations of them from either side that mostly makes the difference. Plus, I think you’ll find quite a bit more data used as a starting point here than on other sites. If you’ve got your own, I’m sure it’ll be welcome. Those companies repaid the aide back to the government. So, it didn’t cost taxpayers. You have been drinking too much of the purple Kool-Aide. Lol……. Actually, they didn’t. Not yet at least. You are mistaking the Federal Loan Guarantee Program for the auto bailout. It is the same program in which Solyndra participated and defaulted on $528 million in taxpayer financing. I’d be curious to see the small business employment numbers over the same period, and especially now, and see the stock market gains in relation to this. I’m in the small to mid-sized business arena (for the most part) and I don’t see the economic “recovery” and job-saving that is currently being bragged about. Are you familiar with the mathematical concept of the derivative? The interesting thing here is that derivative (slope) of the unemployment numbers was negative as we enter the Obama administration and has turned to a positive number since then. Next, I would direct your attention to the second directive. It can be used to determine the deflection point when the trendline changed from one good to bad. When *you* become president of the United States during the worst economic recession since the Great Depression, you can be expected to be judged by how soon the deflection point occurs. Interestingly, the deflection point occurred in this case just about the time the Democratic stimulus bill started spending money. Of course economists find that as novel as gravity pulling one towards the earth. Thanks for giving the space to comment on this. Thanks for following my blog. I am completely familiar with the concepts of first and second derivatives. A consistent increase in private sector employment is consistent with a positve first derivative. My point has nothing to do with the sign of the derivative, but everything to do with its magnitude. The employment situation is simply not improving fast enough to erase a 3.25 million job hole. Additionally, the President had over two years to correct the situation, yet some are still blaming the last President. Much of the Obama stimulus simply replaced local and state debt with federal debt, which probably helped prevent the collapse of state governments, but isn’t necessarily the most effective way to stimulate the economy. Don’t get me wrong, it probably prevented a worse disaster. My only point is that our current economic situation is nothing to write home about or celebrate. Are you familiar with the concept of correlation does not imply causation? Yes, but they often go together…. Unemployment is caused by a number of factors that are too complex to blame one President alone. However, deficits and debt increases are different because a President has direct influence on what goes in the budget through the OMB. My problem with the left on unemployment is that many are portraying the change in unemployment as some sort of triumph for Obama’s economic policies, when in fact the numbers are still awful. The fact that the numbers are still 1.5 percentage points lower than December 2008’s numbers may be an indicator that Obama’s policies are not very effective at creating jobs. Or it may not. But to claim that his policies are an unmitigated success is disingenuous to say the least. Only Obamanists are going to buy that load of bull. Obama had not done one thing that could, in your wildest twisting way, help the economy. I guess it just happened – in spite of the amateur…not. As a matter of fact (actual not made up) the economy was at it’s all time peak in the middle of Bush’s term. Twist away – you’ll learn sometime before you’re covered in dirt but it will be to late. This blog is a perfect example of – Liberals aren’t dumb, it’s just so much that they know just isn’t so! Here in the crux of your assertion you conveniently choose to ignore the reality that a great portion the Bush debt was off book, 2 wars, Medicare part D, the No child left behind policy, just to name few. A great portion of the “relevant metric” Obama debt occurs of putting that off the books debt on the books, not of his policy. First, thank you for reading my blog. Second, I am a bit confused by your argument. I only say this because my post says nothing about deficits or debt, just unemployment. Are you referring to another post? If so, please let me know so that I may provide you with a more relevant and thoughtful response. My apologies. I now see you were referring to the thread and not to the post. I was further confused by your quote of me followed by your statement (without quotes the two statements appeared incongruous). I have heard this contention before and I would love to quantify this effect. Can you point me to an official government website that breaks out this off book debt? Thanks for your help in advance. Let me know how that works out Sean because I rally don’t understand what these people are talking about when they say “off the books” and I can get none to explain it too me. Many liberal posters talk about Clinton’s surplus like it means the balance in the treasury was a positive number and I don’t get that either. I need to clarify my question by saying that I know what they are talking about I just don’t know what they mean. The impression I am getting is that many seem to think that the cost of the war was not added to the debt until after the Bush term. Sorry about that. No worries, George. Thanks again for stopping by. For me, the point of the 1st graph is to illustrate how the trend of shedding jobs at 700,000/mo. reversed into positive territory (albeit not as fast as any of us would have liked). Another table I’ve seen puts unemployment at 7.3% at Pres. Bush’s departure from office, and at 9.2 now. But that one,like your second graph, fails to recognize the momentum with which the economy was falling until it bottomed out with unemployment at 10.3 % or so. We saw some job recovery back into the high 8%s before this last few discouraging months of slow job growth. I know it’s much more complicated than this, but it’s not fair not to recognize that we are still experiencing the residual effects of the initial downturn. As much as we all hated TARP, auto bailouts, stimulus, and QE2, at about the time they kick in we can see unemployment easing. In fact, I wonder if the recent backsliding in jobs indicates that the Administration wasn’t aggressive enough when it might have been in order to provide the momentum necessary to weather obstacles to recovery. It was, after all, the greatest economic shock of most of our lifetimes. The effects of decade unsound tax policy, a misguided war, and poorly regulated banks are going to take more than a couple of years to overcome. Thanks for providing this rational forum for discussion. I would agree with this point. It makes sense given the crash of the 2000 stock market bubble, the second shock from 9/11, two major wars, one of the biggest hurricane disasters in US history, and the 2008 economic crisis. Additionally, you have the beginning of the retirement of the baby boomer generation, which would also have an effect on fewer people working. I don’t doubt this point either. Stimulus programs are great for creating bursts in tempory demand by creating in many cases, temporary, “shovel-ready” jobs. The problem with stimuli is that they are crude macroeconomic levers that are helpful in the short-run, but do not help generate long-term, sustainable economic growth. This explains why unemployment continues to remain persistently high despite a nearly $1 trillion stimulus. I know this is an old thread, but I want to make an observation. It’s interesting that your third chart appears to show that Bush had a net loss of 600,000 to 800,000 private sector jobs; yet you claim he had a net gain of 188,000. 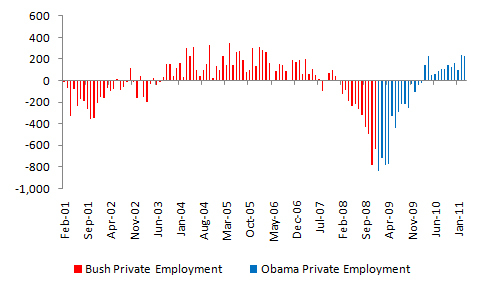 In fact, other sources confirm what I am seeing: Bush had a net loss of roughly 670,000 private sector jobs. It all comes down to methodology. My methodology pins the total jobs lost or gained in a given month on the President who was in office at the end of that month. Therefore, in this version, Obama gets blame for January 2009. However, if you pin January 2009 on Bush, who was in office at the beginning of the month, you get to a number in the range of what you are talking about. In a more recent version of this post, I changed the methodology so that the numbers are based on the fraction of days each President was in office during both January 2001 and January 2009. That way, Bush gets blame for the 19 days out of 31, he was in office in January 2009. This newer methodology is the fairest way I can come up with for the comparison without injecting too much subjectivity. Of course you can make the numbers met your agenda or persuasion with the right methodology. Over the next 6 years things might look more like a foil to bushes entire presidency…the truth is that we will probably never know because such a good job has been done by the right in making Obama look like the anti-christ. I am not a huge fan and I think more could be done but I think your points leave out some very relevant info. For one thing, when things are bad as they have been, no recovery effort will seem like it’s enough, and thats because in the short term there is no automatic cure. It took years of bad decision making, some natural disasters, some man made ones, alot of greed and a whole host of other things to get us in this mess and we aren’t going to get out of it in 2 years. PERIOD. If there was some magic answer or if one sides methods were so clearly superior to the other than the inferior party would be phased in favor of the “magic cure” Every president has had his share of unique challenges and lucky breaks. You can’t say that the economy was only good under Clinton because of the dot com boom and then say that its bad under obama because his policy is horrible. Either give them all the credit for what happens under there administartion (absurd ) or realize that every administration inherits policies and programs that both help and hurt there agenda and the country. I don’t know what the long term effects of the policies enacted in the last two years will be and the truth is that noone on this board including your self can claim to either. If you did you would have a much higher pay grade. I know that some of my response is more in response to other peoples comments than your original article but they are some points you should consider. Your points are all valid and fair. Predicting the complex inputs and outputs of a financial system of 300 million plus people is a bit like predicting weather using chaos theory. There are so many complex puts and takes in the system, that isolating a single cause, person, or policy is nearly impossible. I agree that completely reversing the conditions that were in place at the beginning of Obama’s administration is admittedly an impossible task. That said, one should expect some moderate, no matter how small, improvements. I would argue that things had been stabilized (and had improved) by March 2009. That said, I think things are markedly worse that conditions in March 2009 today. Being that there is no easy answer to the big problem, we have to try some things. As you stated, at least what has been done has stabalized things to some extent. And there are some who would say that an even larger crisis may have been avoided with the steps that have been taken. The problem now is that even if there were some steps that could be taken to further right the ship..it’s not going to happen. Obama is pretty much a lame duck at this point and it seems like the biggest agenda in washington right now is to further discredit the administration to landslide them in the next election. It’s unfortunate because even if the guy across the isle beliefs are different than yours he is still the leader of the nation and there is still alot of work to be done…we can’t afford to waste two years proving that you would do a better job…we have to come together on the points that we can. Personally I feel too many people vote the party line and not the issues. We cannot truly move forward as a nation to fix some of these major issues in our government until we abolish the party system and lobbyists. You should vote for someone based upon there convictions and ideals not who they affiliate themselves with. And what other profession is it acceptable to take huge bribes for special considerations? I agree. I have become frustrated with both parties in recent years. I am frustrated with the Democrats because they support an ideology that is so alien to my own beliefs and experiences, that I sometimes wonder if they live in the same country I do. I am frustrated with Republicans, because the party’s leaders have become less pragmatic and rational in recent years, and far more ideological. The Democratic Party used to be the Party of emotion, while the Republican Party used to be the party of rationalism. Not so anymore. I feel like the political system has devolved into one in which voters must simply choose the lesser evil. By the time President Obama leaves in 2017, unemployment will be back down to approximately the 4% rate, and the economy will have been humming along for several years. History tells us that twice as many jobs are created during a Democratic administration than during a Republican one. Ever since the unemployment rate has been recorded, no Democratic President has left office with a higher unemployment rate than when he entered office; only one Republican (Reagan) did the same. I want to correct the record on the Bush debt which people claim to be in the $5 trillion range. The 2009 Fiscal budget was crafted during the Bush administration, effective October 1, 2008, through September 30, 2009. The deficit from that fiscal year is almost exclusively attributed to Bush, not President Obama. Bush’s annual deficits have totaled almost $6 trillion. Daniel J.Mitchell, from the CATO Institute, also agrees with that assessment. Looking at some of the fact checking sites such as Factcheck.org or politifact.org is also helpful in looking at these issues. Looking at when a president is in office for figures seems extremely misleading to me. The best measure, I believe, is when their budgets are passed. According to those graphs above, unemployment peaked in June 2009, yet you seem to consider that portion as much Obama’s as the ensuing 3 year drop in unemployment. Do you not consider that there is some time lag there? Doesn’t it take at least some time for a business to progress from determining the need for a new employee to the final hiring? To put it another way, assume the greatest President possible got elected. (OK, Reagan if you insist). When do you think unemployment would begin to drop? Jan 2? “Sounds like a reasonable assessment to me”, refering to the comment “both graphs are’nt worth a damn”. Well, you sure twisted you head into a pretzel trying to but a conservetive spin on them. You take solice in Bush’s 7.3 like it’s an acheivement. You fail to point out that under him UE went up to that point whereas under Obama it is moving DOWN to that point. You do realize that when Obama became President, unemployment was at 7.8%. Over three years later it is at 8.3%. After reading the comments section in its entirety, I’ve came to believe that no matter what anyone says to him, Mr. Hazlett will never change his position on Obama, or Bush, or reality for that matter. Everyone needs to calm down and move on. What matters now is making sure Romney doesn’t get in and start this nonsense again. Since I now know that I’m included in the 47% of the population that MItt Romney doesn’t care about, I’ve reaffirmed my vote for Obama in 48 days. I haven’t changed my position because no one’s made a persuasive enough argument to convince me otherwise. That said, if you don’t pay any federal income taxes today, you probably should vote for Obama. He’ll be more likely to protect your rent extraction from the American tax payer. Statistics, in this case, are smoke and mirrors. I don’t care what DATA is coming out of Washington, the fact of the matter is finding a job that pays enough to feed a family is far and few between. A job at Wal-Mart doesn’t quite get you there, unfortunatly, it still qualifies as a job. To those of you defending this moron of a president are really naive. I don’t know part of the country youre from, but in my part, my quality of life as well as those around me has diminished. I am working 33% more to earn 40% less money. I CAN speak for the majority of the non union, college educated has -beens around me as well. This is in addition to the higher cost of fuel, goods, and services. The bottom line is his policies are costing busineses more money, which means they have less money to pay employees. Furthermore, business then pass on additional cost to consumers, so it’s a double loss. If you think this man’s vision of the American dream is the same as yours, think again. Is it more possible that business is doing what business does. Streamline and upgrade skilled employees. I work in tech and the IT guy from 15 years ago cant cut it today. Outsourcing and improvements has eliminated 50% of the labor requirements. So its a natural cycle that businesses are not hiring for jobs they don’t need filled. The problem in the US is lack of training for the future. All those green companies and New Technologies should be helped along so they can become the next Ford or HP or Microsoft. Not saying we need to fund them directly, but improve infrastructure and education. Imagine if everyone had 1 tbps internet speed. How would that affect the growth or online companies and foster innovation. To tie it back in to your comments, Republicans are not spending enough on the education or infrastructure. Tech companies hate them. They are too focused on negative social name calling and trying to stop Obama. They offer no solutions, only complaints. You dont have to defend Obama to call out all the republicans as morons. As i call you, moron. Here’s my thoughts on unemployment…. Employers have gotten lazy. What I mean by that is you can no longer get a job in the same manner you could 10 years ago. I remember when you could walk into a business professionally dressed, resume in hand, and ask for an interview. Today you are directed to the internet to fill out an application, which is fed into a system that does keyword search optimization. Everyone wants someone with experience, but how do you gain experience when the opportunity isn’t provided? I remember when it didn’t take a piece of paper to sell you, but the ability to sell yourself at the face to face interview…. where your lack of skill was replaced by the conviction in how you sold yourself and the idea that you can do ANYTHING if given the opportunity. I make this announcement today…. IF employers went back to actually conducting face to face interviews on the spot then the job crisis would show drastic improvement, but as long as employers decide lazy is in then there will be no improvement. By the way I was unemployed for 8 months, and the job I have now is because I was given the opportunity to sell myself and they saw value in me… not my resume.. which is pretty impressive as well. Especially since the field I am in now id one I have never been in before. This article is the work if a lying fraud who is noting but a rightwing hack. It’s sad how RWers live in a world of delusion, hate, rage, racism & bigotry. They are anti-American because they cheer on every bad thing that happen to Americans. Well, Jennifer, that’s your opinion. But here’s a friendly piece of advice. When you call someone a lying fraud and right wing hack who hates America, it will generally help your argument if you offer some evidence to substantiate your claims. Right now your argument boils down to ad hominem and sweeping generalizations. If you are going to post on this blog, I expect you to write a more refined and thoughtful argument than the one you’ve posted here. Otherwise, you’re only hurting your cause.